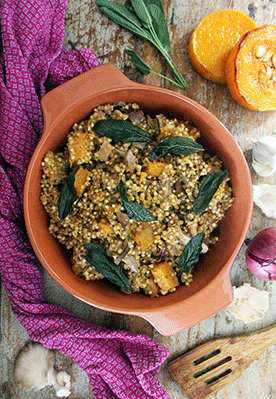 This creamy buckwheat risotto is complemented by sweet butternut squash, mixed mushrooms and crispy sage. Nutritional yeast is blended with coconut yogurt and added to the risotto for extra creaminess and a subtle ‘cheesy’ flavour. 1. Preheat the oven to 200°C/180° fan assisted. Arrange the butternut squash cubes across a shallow oven tray and drizzle with 1 tablespoon of coconut oil. Roast for 15 minutes until tender. 2. Heat 2 tablespoons of coconut oil in a large pan over medium heat. Add the onion, garlic and mushrooms and sweat until tender. 3. Add two-thirds of the roasted squash and all of the buckwheat to the pan. Season well and add the dried sage. Stir well to combine. 4. Add the hot stock to the pan and bring to the boil. Reduce to a simmer and cook until all the liquid has evaporated – about 15 minutes. Stir regularly. 5. Whilst the risotto cooks, add the remaining squash to a blender with the coconut yogurt, apple cider vinegar and nutritional yeast. Season with a little salt and pepper and blend until creamy. 6. Heat the remaining oil in a pan over medium heat and add the sage leaves. Coat them in the oil and fry until crisp. 7. When all the liquid has evaporated from the risotto, add the creamy squash and yogurt mixture and stir through until well combined and the risotto is cooked through. Scatter with crispy sage leaves to serve.